The importance of a safe, working parking lot cannot be overstated. After a long, hard winter, pothole repair is on everybody’s mind. From commercial and industrial parking lots to apartment and condominium complexes, the importance of a safe, working parking lot cannot be overstated. When workers, visitors and residents come and go, they expect to navigate a parking lot that is free of potholes and cracks. Fortunately, we can greatly improve the condition of your parking lot by filling the potholes with hot mix asphalt that is then compacted. Keep in mind that there may be times when it’s structurally necessary to repair a larger patch of the lot. In instances such as this, we present the options, which are closely tied to your budget and how the area will be used in the future. As industry leaders, we have many means and methods for making the parking lot safe again. In addition to asphalt paving and repair, we also offer concrete repair and maintenance services, including sidewalks, catch basins, dumpster pads and curb repair. Perhaps there’s a dumpster pad on the corner of your parking lot, and it’s cracked or busted and needs to be repaired. That dumpster pad not only looks bad, but it may pose structural problems as well. 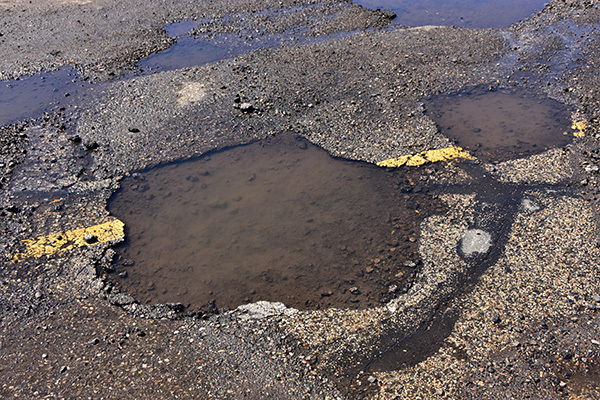 If not properly repaired, water can make its way underneath the asphalt pavement and run to the catch basin below. The same is true of concrete sidewalks and curbs, which if not addressed could lead to wash-out on the pavement.